Not for everyone, but if you need to get a few Easter eggs for gifts etc then Boots have these dropped down to £2 at the moment. Next best price is 3 for £10 from Morrisons. Boots RRP is £6.50 which is laughable, but for £2 you can’t complain, and the kids will love them. 200g of chocolate. And available in milk and white chocolate. Not sure if nationwide. This was Newcastle UL, staffs. Let's trust these don't get accused of being racist like the Waitrose ones did. Not sure sorry. I imagine not. Hopefully someone can verify if this is nationwide in any other stores. There seems to be a glut. I purchased the Christmas ones last month and they expire in August. They were even cheaper than these. 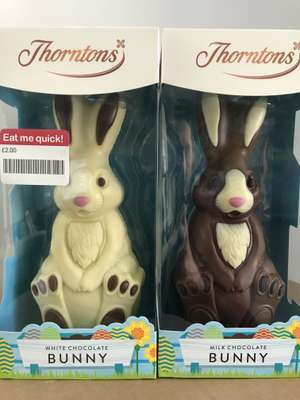 £1 for 100g is not bad for Thorntons. I did a blind taste test of Cadbury's, Mars and Thorntons. I’ll have get a few to do a blind test to confirm your result. Date on them is November, which is same as Morrison’s stock too, so not sure why else so cheap? The lady in boots suggested they’d ordered too many and won’t shift them in time. Date on them is November, which is same as Morrison’s stock too, so not s …Date on them is November, which is same as Morrison’s stock too, so not sure why else so cheap? The lady in boots suggested they’d ordered too many and won’t shift them in time. The best before dates on the ones I bought from my local Heron store today for £3 each were different to those you spotted in Boots-the white chocolate one was December 31st 2019 & the milk chocolate one was March 31st 2020! Deal posting newbie! This is Chris333 first deal post. Help out by leaving a posting tip or just to show your appreciation for their contribution.